NASA, the agency that successfully sent men to the moon, and brought them back, is now scavenging space shuttles consigned to museums. When the space shuttle program was shut down in 2011, the four remaining craft were sent to museums around the United States. Now, those shuttles are being stripped for useful parts. This week, Nasa is removing four tanks that stored water for the crew of the shuttle Endeavour, which is parked permanently in the California Science Center. 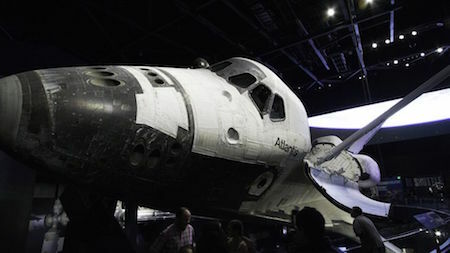 Back in May, the same tanks were removed from the shuttle Atlantis, on display at the Kennedy Space Center in Florida. This idea was used in Larry Niven and Jerry Pournelle's 1985 novel Footfall, where mothballed space shuttles and battleship weapons are used to fight the fithp.